It returns the distance between the player and the enemy. 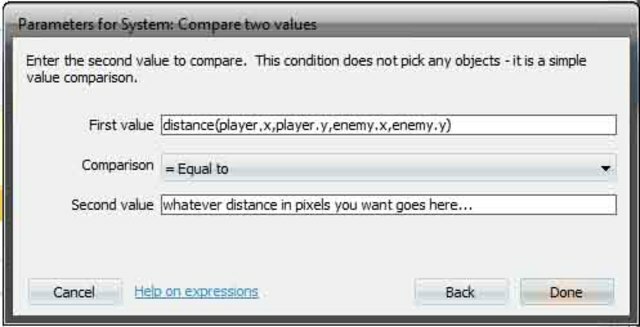 Under the systems options when creating an even there is an option to compare two values. Use the formula Ragtime mentioned to perform the actions you described. then do whatever you want them to do to "attack" the player. We could make you a capX but then you wouldn't learn where the button was..and for your next game it is a fair to reasonable presumption, at this stage that you would ask a similar question again.. If you are new to Construct 2 as you mentioned...The Newly finished MANUAL is a really good idea to "start" your epic adventures into becoming a star performer...Do some serious reading..Grab a few bikkies and a cup of tea coffee or yak milk and grace your eyes and brain with as many of the exquisitely crafted pages of the manual as you can muster in a single setting..The more you put in the more you will get out.. In the mean time I recommend checking out farsmile90's "Chaos Game Example"
Unfortunately The Event Sheet is not commented at all so..
You may find it harder to follow but it does use the native/standard Construct 2 Event Sheet Scripting language...so it isn't too hard to figure out...and you learn at the same time....Great stuff...Kudos to "farsmile90"
Looking forward to seeing your first game...best of luck..
Of the distance as I understood, but as I get the enemy go towards my to attack me. IF you don't understand, just mail me. Try the beginners tutorial , because I don't think you did it ! It covers all the basics !